^ 谷田憲俊 (2009). 感染症学 (改訂4 ed.). 診断と治療社. ISBN 9784787817440. ^ a b c d e f g h i j “Poliomyelitis” (PDF). Epidemiology and Prevention of Vaccine-Preventable Diseases (The Pink Book) (11th ed.). Washington DC: Public Health Foundation. (2009). pp. 231–44. http://www.cdc.gov/vaccines/pubs/pinkbook/downloads/polio.pdf. ^ “Late functional loss in nonparalytic polio”. American Journal of Physical Medicine & Rehabilitation 79 (1): 19–23. (2000). doi:10.1097/00002060-200001000-00006. PMID 10678598. ^ a b The Gale Encyclopedia of Neurological Disorders. Detroit: Thomson Gale. (2005). pp. 1859–70. ISBN 0-7876-9150-X. ^ a b c Leboeuf C (1992) (PDF). The late effects of Polio: Information For Health Care Providers.. Commonwealth Department of Community Services and Health. ISBN 1-875412-05-0. オリジナルの2008-06-25時点によるアーカイブ。. https://web.archive.org/web/20080625212726/http://www.health.qld.gov.au/polio/gp/GP_Manual.pdf 2008年8月23日閲覧。. ^ a b c d e Manual of infantile paralysis, with modern methods of treatment.. Philadelphia Davis. (1914). pp. 79–101. OCLC 2078290. https://books.google.com/?id=piyLQnuT-1YC&printsec=titlepage. ^ Wood, Lawrence D. H.; Hall, Jesse B.; Schmidt, Gregory D. (2005). Principles of Critical Care (3rd ed.). McGraw-Hill Professional. p. 870. ISBN 0-07-141640-4. ^ Cohen JI (2004). “Chapter 175: Enteroviruses and Reoviruses”. Harrison's Principles of Internal Medicine (16th ed.). McGraw-Hill Professional. p. 1144. ISBN 0-07-140235-7. ^ a b c “Enteroviruses”. Sherris Medical Microbiology (4th ed.). McGraw Hill. (2004). pp. 535–7. ISBN 0-8385-8529-9. ^ Katz, Samuel L.; Gershon, Anne A.; Krugman, Saul; Hotez, Peter J. (2004). Krugman's infectious diseases of children. St. Louis: Mosby. pp. 81–97. ISBN 0-323-01756-8. ^ a b c d e “Vaccine-derived polioviruses and the endgame strategy for global polio eradication”. Annu Rev Microbiol 59: 587–635. (2005). doi:10.1146/annurev.micro.58.030603.123625. PMID 16153180. ^ “Nonpoliovirus poliomyelitis simulating Guillain-Barré syndrome”. Archives of Neurology 58 (9): 1460–4. (September 2001). doi:10.1001/archneur.58.9.1460. PMID 11559319. http://archneur.jamanetwork.com/article.aspx?articleid=780244. ^ a b Parker SP, ed (1998). McGraw-Hill Concise Encyclopedia of Science & Technology. New York: McGraw-Hill. p. 67. ISBN 0-07-052659-1. ^ a b Racaniello V (2006). “One hundred years of poliovirus pathogenesis”. Virology 344 (1): 9–16. doi:10.1016/j.virol.2005.09.015. PMID 16364730. ^ “Chronic progressive poliomyelitis secondary to vaccination of an immunodeficient child”. N Engl J Med 297 (5): 241–5. (1977). doi:10.1056/NEJM197708042970503. PMID 195206. ^ Chandra R (1975-06-14). “Reduced secretory antibody response to live attenuated measles and poliovirus vaccines in malnourished children”. Br Med J 2 (5971): 583–5. doi:10.1136/bmj.2.5971.583. PMC: 1673535. PMID 1131622. https://www.ncbi.nlm.nih.gov/pmc/articles/PMC1673535/. ^ Horstmann D (1950). “Acute poliomyelitis relation of physical activity at the time of onset to the course of the disease”. J Am Med Assoc 142 (4): 236–41. doi:10.1001/jama.1950.02910220016004. PMID 15400610. ^ “Mechanism of Injury-Provoked Poliomyelitis”. J. Virol. 72 (6): 5056–60. (1998). PMC: 110068. PMID 9573275. https://www.ncbi.nlm.nih.gov/pmc/articles/PMC110068/. ^ Evans C (1960). “Factors influencing the occurrence of illness during naturally acquired poliomyelitis virus infections” (PDF). Bacteriol Rev 24 (4): 341–52. PMC: 441061. PMID 13697553. http://mmbr.asm.org/cgi/reprint/24/4/341.pdf. ^ (PDF) Chapter 26:Poliomyelitis. in: Immunisation Against Infectious Disease, 2006. Edinburgh: Stationery Office. (2006). pp. 313–29. ISBN 0-11-322528-8. http://www.immunisation.nhs.uk/files/GB_26_polio.pdf. ^ “Antibodies against vaccine-preventable diseases in pregnant women and their offspring in the eastern part of Germany”. Med Microbiol Immunol 190 (4): 167–72. (2002). doi:10.1007/s00430-001-0100-3. PMID 12005329. ^ “Complexes of Poliovirus Serotypes with Their Common Cellular Receptor, CD155”. J Virol 77 (8): 4827–35. (2003). doi:10.1128/JVI.77.8.4827-4835.2003. PMC: 152153. PMID 12663789. http://jvi.asm.org/cgi/content/full/77/8/4827?view=long&pmid=12663789. ^ a b c Baron S, ed (1996). “Picornaviruses: The Enteroviruses: Polioviruses”. Baron's Medical Microbiology (4th ed.). Univ of Texas Medical Branch. ISBN 0-9631172-1-1. http://www.ncbi.nlm.nih.gov/books/bv.fcgi?rid=mmed.section.2862. ^ Sabin A (1956). “Pathogenesis of poliomyelitis; reappraisal in the light of new data”. Science 123 (3209): 1151–7. doi:10.1126/science.123.3209.1151. PMID 13337331. ^ a b c d e “Poliovirus and poliomyelitis: a tale of guts, brains, and an accidental event”. Virus Res 111 (2): 175–93. (2005). doi:10.1016/j.virusres.2005.04.008. PMID 15885840. ^ a b c Polio. Diseases and People. Berkeley Heights, NJ: Enslow Publishers. (2001). p. 12. ISBN 0-7660-1592-0. ^ a b “Post-polio syndrome: pathophysiology and clinical management”. Critical Review in Physical Medicine and Rehabilitation 7: 147–88. (1995). http://www.ott.zynet.co.uk/polio/lincolnshire/library/gawne/ppspandcm-s00.html. Reproduced online with permission by Lincolnshire Post-Polio Library; retrieved on 10 November 2007. ^ Young GR (1989). “Occupational therapy and the postpolio syndrome”. The American Journal of Occupational Therapy 43 (2): 97–103. doi:10.5014/ajot.43.2.97. PMID 2522741. オリジナルの2007年8月11日時点によるアーカイブ。. 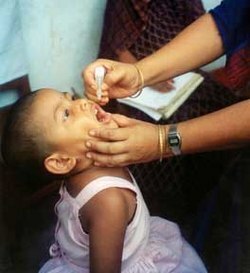 https://web.archive.org/web/20070811122404/http://www.ott.zynet.co.uk/polio/lincolnshire/library/gryoung/otapps.html. ^ “The epidemiology of poliomyelitis: enigmas surrounding its appearance, epidemicity, and disappearance”. Am J Epidemiol 110 (6): 672–92. (1979). PMID 400274. ^ a b c Professional Guide to Diseases (Professional Guide Series). Hagerstown, MD: Lippincott Williams & Wilkins. (2005). pp. 243–5. ISBN 1-58255-370-X. ^ a b Hoyt, William Graves; Miller, Neil; Walsh, Frank (2005). Walsh and Hoyt's clinical neuro-ophthalmology. Hagerstown, MD: Lippincott Williams & Wilkins. pp. 3264–65. ISBN 0-7817-4814-3. ^ “Case definitions for infectious conditions under public health surveillance. Centers for Disease Control and Prevention” (PDF). Morbidity and mortality weekly report 46 (RR–10): 26–7. (1997). PMID 9148133. ftp://ftp.cdc.gov/pub/Publications/mmwr/rr/rr4610.pdf. ^ Chezzi C (July 1996). “Rapid diagnosis of poliovirus infection by PCR amplification”. J Clin Microbiol 34 (7): 1722–5. PMC: 229102. PMID 8784577. https://www.ncbi.nlm.nih.gov/pmc/articles/PMC229102/. ^ Gawande A (2004-01-12). “The mop-up: eradicating polio from the planet, one child at a time”. The New Yorker: 34–40. ISSN 0028-792X. ^ Daniel, Thomas M.; Robbins, Frederick C. (1997). Polio. Rochester, N.Y., USA: University of Rochester Press. pp. 8–10. ISBN 1-58046-066-6. ^ a b Goldberg A (2002). “Noninvasive mechanical ventilation at home: building upon the tradition”. Chest 121 (2): 321–4. doi:10.1378/chest.121.2.321. PMID 11834636. ^ a b c d Neumann D (2004). “Polio: its impact on the people of the United States and the emerging profession of physical therapy” (PDF). The Journal of orthopaedic and sports physical therapy 34 (8): 479–92. doi:10.2519/jospt.2004.0301. PMID 15373011. http://www.post-polio.org/edu/hpros/Aug04HistPersNeumann.pdf. Reproduced online with permission by Post-Polio Health International; retrieved on 10 November 2007. ^ Cuccurullo SJ (2004). Physical Medicine and Rehabilitation Board Review. Demos Medical Publishing. ISBN 1-888799-45-5. http://www.ncbi.nlm.nih.gov/books/bv.fcgi?&rid=physmedrehab.table.8357. ^ “Tracheotomy in bulbar poliomyelitis”. California medicine 72 (1): 34–6. (1950). PMC: 1520308. PMID 15398892. https://www.ncbi.nlm.nih.gov/pmc/articles/PMC1520308/. ^ Wackers, G. (1994). Constructivist Medicine. PhD-thesis. Maastricht: Universitaire Pers Maastricht. オリジナルの2007年12月23日時点によるアーカイブ。. https://web.archive.org/web/20071223223131/http://www.fdcw.unimaas.nl/personal/WebSitesMWT/Wackers/proefschrift.html#h4 2008年1月4日閲覧。. ^ “Comparison between concentric needle EMG and macro EMG in patients with a history of polio”. Clinical Neurophysiology 110 (11): 1900–8. (1999). doi:10.1016/S1388-2457(99)00150-9. PMID 10576485. ^ “Neural cell adhesion molecule in normal, denervated, and myopathic human muscle”. Ann. Neurol. 21 (5): 481–9. (1987). doi:10.1002/ana.410210512. PMID 3296947. ^ a b “Late effects of polio: critical review of the literature on neuromuscular function”. Archives of physical medicine and rehabilitation 72 (11): 923–31. (1991). doi:10.1016/0003-9993(91)90013-9. PMID 1929813. ^ “Post-poliomyelitis syndrome”. Muscle Nerve 31 (1): 6–19. (2005). doi:10.1002/mus.20259. PMID 15599928. ^ a b “Muscle adaptive changes in post-polio subjects”. Scandinavian journal of rehabilitation medicine 21 (1): 19–26. (1989). PMID 2711135. ^ a b “Post-poliomyelitis syndrome”. Muscle Nerve 31 (1): 6–19. (2005). doi:10.1002/mus.20259. PMID 15599928. 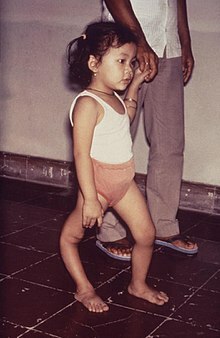 ^ “Epidemiology of the post-polio syndrome”. Am. J. Epidemiol. 136 (7): 769–86. (1992). doi:10.1093/aje/136.7.769. PMID 1442743. ^ “Post-poliomyelitis syndrome: case report and review of the literature” (PDF). Ann Acad Med Singap 34 (7): 447–9. (2005). PMID 16123820. http://www.annals.edu.sg/pdf/34VolNo7200508/V34N7p447.pdf. ^ Committee on Infectious Diseases (2009). RED BOOK. American Academy of Pediatrics. p. 542. ISBN 9-78158-110306-9. https://redbook.solutions.aap.org/DocumentLibrary/RB2009.pdf. ^ 世界ポリオ根絶に向けて Archived 2013年8月22日, at the Wayback Machine. ^ Callaway, Ewen (2011). “Public health: Polio clings on in Pakistan”. Nature 473 (7348): 427-428. doi:10.1038/473427a. ISSN 0028-0836. ^ Christopher Hitchens (2008). God Is Not Great: How Religion Poisons Everything. Allen & Unwin. p. 51. ISBN 978-1-74175-572-5. http://books.google.com/books?id=cZ1dgxQx8tMC.